We’d love your help. Let us know what’s wrong with this preview of Paid Attention by Faris Yakob. Rapid changes in communication technologies shifted the media environment from one of scarcity to one characterized by abundance. Advertisers are paying more and more money to reach fewer and fewer people, as audiences consume endless streams of content across different platforms. When you can no longer buy enough attention for advertising to remain efficient -- how do bra Rapid changes in communication technologies shifted the media environment from one of scarcity to one characterized by abundance. Advertisers are paying more and more money to reach fewer and fewer people, as audiences consume endless streams of content across different platforms. When you can no longer buy enough attention for advertising to remain efficient -- how do brands respond? Spanning communication theory, neuroscience, creativity and innovation, media history, popular culture, branding, and emerging technologies, Paid Attention explores how ideas move people and how advertising can and should change in response to changes in the communication landscape. Topics covered include: a critical look at market research, modern theories of communication, the vanishing difference between content, media, and advertising, what ideas are and how to get them, and the future of advertising. To ask other readers questions about Paid Attention, please sign up. 1) It starts with a great historical overview of how advertising has come to be (and why you should be proud to be a part of it). 2)It goes on to provide a solid base to form your own ideas.. by doing something as "awesome" as stealing. "Imitation defaces, stealing makes something better, 'or at least something different'. The key is that something else is created, something 'new'. 3) It provides you with the tools to help you make it happen: Combination tool, Brainstorming exercises, case studies and brief templates. Plus, the wide range of examples and stories also were super helpful in bringing context and understanding to some of the bigger ideas being discussed. If average Facebook user creates 90 pieces of content per month and there's a billion+ of them, how advertising industry should change its ways to be effective? This is a hell of a task and Yakob tackles it with intelligence. It would be naive to expect easy and clear answers, but the questions raised, the examples given provide some valuable insights. Today’s most valuable resource is attention. Advertising is the business of capturing and selling that attention. Today’s most valu­able re­source is at­ten­tion. Ad­ver­tis­ing is the busi­ness of cap­tur­ing and sell­ing that at­ten­tion. I apologise to Faris Yakob for the lateness of this Paid Attention review. I started reading early, then grad school started. I picked it up again during the mid-year break and kicked myself for not reading it during semester. It was perfect for what I was studying. Alas, school started back, and it took this week’s storm and power outage to finish it. Yes, the delay did impact my perception of this book, and I’m scared my review won’t give credit to such a well-researched and written book. What’s I apologise to Faris Yakob for the lateness of this Paid Attention review. I started reading early, then grad school started. I picked it up again during the mid-year break and kicked myself for not reading it during semester. It was perfect for what I was studying. Alas, school started back, and it took this week’s storm and power outage to finish it. Putting it simply: branding and the advertising industry. Faris is a co-founder of the agency, Genius Steals and has worked with Spies&Assasins, MDC Partners, McCann Erickson NYC, and Naked Communications. An impressive resume and he uses that experience to give depth and personal anecdotes to the book. He starts with discussing brand and its connection to communication. There’s some history, some anthropology, with some philosophy thrown in. Mixing it with case studies, Faris explains the importance of a strong brand. As a generalist marketer with a slant towards digital, chapter five caught my attention. Yes, the marketing streams are merging, and brand is more important because of it. This chapter set the scene nicely for a discussion and honest critique of the advertising industry near the end of the book. The blurring has made it harder for advertising agencies because integrated marketing communications is effective, and specialized agencies need to evolve. It was a mature, well-presented argument for change, or maybe I’m more sensitive to it after last week’s #HootChat discussing the media industry’s unwillingness to adapt. This is another of the books that support my views and ideas. I don’t know if that gives me bias, but Faris has used many case studies of brands and situations the reader would be familiar with. I suppose any bias can be excused. Through Paid Attention, Faris has acted Tool Kits. These are half-page, quick reference guides to tasks like, “Six Steps to Being Social” and “”Combination Tool for Buyer Behavior”. They’re also on the publisher’s website as PDFs – very useful. I’ll be using “How to Create a Case Study” for grad school this semester. Who is Paid Attention For? The world of advertising is changing, even though it still relies upon basic, long-standing principles. It is just that advertisers are slowly getting a greater understanding of what makes us tick and, of course, they seek to utilise the latest communications technologies and methods. As consumers and recipients of advertising we are being bombarded by more and more commercial messages in an ever-increasing multitude of ways, so perhaps we are becoming on one hand hardened and resistant to the me The world of advertising is changing, even though it still relies upon basic, long-standing principles. It is just that advertisers are slowly getting a greater understanding of what makes us tick and, of course, they seek to utilise the latest communications technologies and methods. As consumers and recipients of advertising we are being bombarded by more and more commercial messages in an ever-increasing multitude of ways, so perhaps we are becoming on one hand hardened and resistant to the messages whilst, on the other hand, being softened and more receptive to the messages that do break through. This book draws upon a multidisciplinary approach, pulling elements from areas such as communications theory, neuroscience, history, culture and technology to look at how advertising can be made efficient, relevant, targeted and reactive to changes. Reading the book feels, at times, like one is sitting on an intellectual rollercoaster as you bounce between different subjects and disciplines, twisting and turning along the way with the senses being submitted to all sorts of pressure and stimuli. Yet the ride is exhilarating and you don’t feel cheated at the end of the journey: you just want more, more of the same! It is certainly a challenging, engaging read, being something that is more thought provoking than spoon-feeding “what you need to do to achieve X”. This reader liked it and found it a pleasant way of spending a few evenings on the sofa: it easily beat the dire fare being offered by the television. As it typical of a book from this publisher, it is well laid out, clearly signposted and a mass of further reading sources are presented for the reader’s attention. Plus, of course, buoyed by excellent, engaging, focussed and considered content! If you are interested in the world of advertising or work within it, this could be a little gem that you should strongly consider adding to your library. The one thing this book needs is a great editor. There's no doubt how smart and full of insights Faris is. And he starts out on a high note, explaining to the reader how media have multiplied, fragmented and taken the audience with them. But then he doesn't dive deeper into the art and science of attention, heading into all kind of directions, talks about the future of planners, agencies and brands. He discussed many wonderful ad campaigns, discusses the sad state of research and why advertising The one thing this book needs is a great editor. There's no doubt how smart and full of insights Faris is. And he starts out on a high note, explaining to the reader how media have multiplied, fragmented and taken the audience with them. But then he doesn't dive deeper into the art and science of attention, heading into all kind of directions, talks about the future of planners, agencies and brands. He discussed many wonderful ad campaigns, discusses the sad state of research and why advertising is not dead. He's all over the place. There are so many great nuggets of insights but they get lost in the vast amount of unfocused content. I believe this could have been a great book if there was an editor worth a dime. 3 stars because Faris has the goods but the editor was missing in action. This is a must-read book for any practitioners in the ads industry, which explains quite comprehensively the very basic principles of advertising that remains neglected and how those basics remain and are applied in the new digital world. The book is rich in theories in different grounds, from psychology, anthropology to economics, thus providing a scientific understanding of advertising. Definitely come back to read it again someday. Enjoyable and really good food for thought. I was surprized at how much background research the book went through in the beginning, having seen the author speak. I expected something a bit more entertaining. That said, the book provides some great structure for how to think about marketing in today's world. Glad I read it and have some notes for myself to bring forward to my job. I truly enjoy to read the point of view of such an experienced professional in advertising. It's actually a very challending age we're living right now, and for most word of mouth marketers (like me) it's good to know how advertisers think these days. 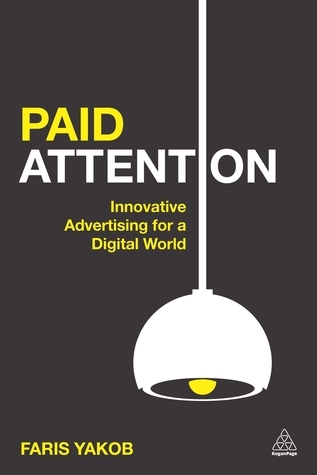 Paid Attention is a wonderful book about new ways of advertising in a Digital World.